Grajal de Campos Castle is located in Grajal de Campos city, in the province of Leon, Spain. The town is very small, less than three hundred people live in it. The city shows the influence of mozarabic views, showing that long ago the city was densely populated. Grajal de Campos Castle, according to some sources, became property of the famous Spanish family Vega, in the fifteenth century, along with the city. According to other studies, Hernando de Vega was the one who started the construction of the magnificent building in the early sixteenth century. The castle was built on the ruins of many ancient castles that wee built around the tenth century. Grajal de Campos Castle was built by Hernando de Vega with his Juan de la Vega de Acuna. With the blessing of his father, who was a fervent Catholic, he managed to complete the monumental building and then lived in it. Grajal de Campos Castle was built in a special way - in accordance with the latest techniques of the time, so that the castle is built to last a really long siege. It was protected in a way that would make any attack senseless. 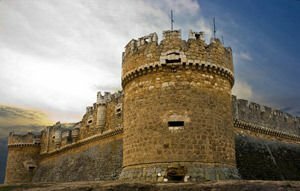 The castle itself consists of a huge square that has a giant tower, located in every corner of the fortress wall. Within the walls there are many doors that have a distinct slope. Each tower is decorated in its upper part with beautiful architectural ornaments with a strict geometric shape. The castle is in good condition, although many centuries have passed, since it was built. Huge numbers of tourists from all over the world flock here every year to be able to see this amazing castle of Spanish historical value. The castle was named, in 1931, a historic-artistic monument and is protected as cultural heritage of Spain. The castle is the emblem of the city and the province of Leon. From the castle is a magnificent view, while the Grajal de Campos Castle is a favourite of photographers from around the world who come here to perpetuate this great building.